In conjunction with the upcoming Father’s Day celebration, TNT Express Malaysia has launched its ‘Honouring Fathers’ contest with an aim to connect loved ones. The ‘Honouring Fathers’ contest is open to all Malaysians. 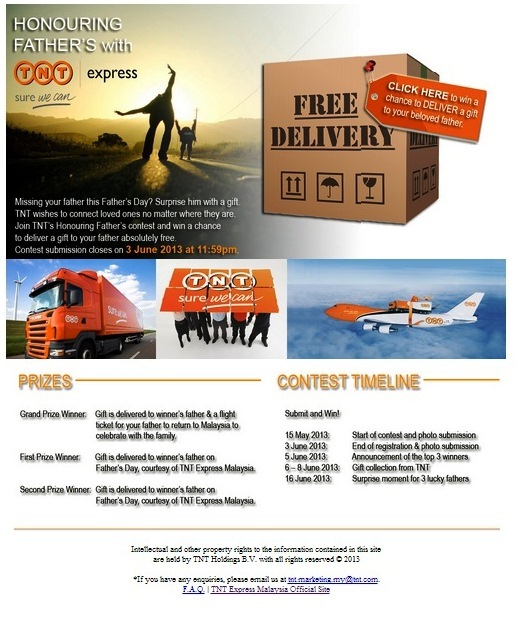 Participants are to visit TNT Express Malaysia website at www.tnt.com.my and click the Father’s Day icon. They will then upload a photo of themselves with their father plus share their message to their father in less than 20 words. Submission ends on 3 June 2013. On 5 June 2013, the top 3 winners will be announced. Winners will get a chance to deliver their gift to their fathers anywhere around the world absolutely free. In addition, the grand prize winner’s father will get a flight ticket to return to Malaysia to see the family. For more information about the contest, visit www.tnt.com.my.